Columbia, Mo. 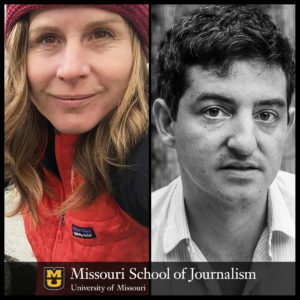 (Sept. 5, 2018) — The Missouri School of Journalism will welcome radio journalist and podcast producer Amy Martin and writer/author Nathaniel Rich to campus Sept. 19-21. The visit is part of the Smith/Patterson Science Journalism Fellowship and Lecture Series, a joint initiative of the Pulitzer Center Campus Consortium and the Missouri School of Journalism. Radio journalist and podcast producer Amy Martin and writer/author Nathaniel Rich are scheduled to host a joint lecture, “A Conversation on Climate Change,” at 6 p.m. on Sept. 20 in Fisher Auditorium, Gannett Hall. The event is free and open to the public. The two will host a joint lecture, “A Conversation on Climate Change,” at 6 p.m. on Sept. 20 in Fisher Auditorium, Gannett Hall. Martin and Rich will discuss their work documenting the history and effects of climate change and possible ways forward. The evening event is free and open to the public. “Climate change is perhaps the biggest challenge of our time. We’re grateful to have these two journalists here to share their insights,” said Associate Professor Sara Shipley Hiles, who oversees the Smith/Patterson program. Martin is the founder and executive producer of Threshold, a podcast and public radio show that takes deep dives into complicated environmental topics. Season Two will take listeners on an epic adventure through the Arctic. The Montana Broadcasters Association named Threshold “Best Non-Commercial Radio Program of the Year” in June 2017. In addition to producing her podcast, Martin files stories for NPR’s All Things Considered, PRI’s The World, Here and Now, and other outlets. The New York Times Magazine recently devoted its entire Aug. 5 issue to Rich’s story, “Losing Earth: The Decade We Almost Stopped Climate Change.” The article, which reveals how close humankind came to addressing climate change in the decade 1979-1989, addresses the formation of current narratives around climate change and why this problem has remained so difficult to solve. The Smith/Patterson Science Journalism Fellowship and Lecture Series was established in 2008 by Missouri alumnus Russell G. Smith II and his wife, Gail, to honor Joye Patterson, Smith’s former professor and mentor. Patterson was a faculty member from 1965 to 1989 at the Missouri School of Journalism, where she was credited by her peers with inventing the modern approach to teaching science writing.